Welcome to another Design Me exercise day on Boards and Barley. As a former competitive athlete I know the importance of practice. As a soccer player it is important to practice with your team so that you can learn how you work together on the field. But it is also important to practice and exercise on your own so you make sure your body is in the best shape possible so that you can be successful when it’s game day! I feel like exercise and practice are important for the brain as well. That’s why I’ve been writing these Design Me articles. The idea for these articles is to exercise my brain so that I can perform as well as I can when actually designing games with the intent of pitching them some day. Such a cool tool for inspiration! So today we are going to exercise our brain and come up with a bidding/auction game with a holy theme where the goal is to place all your pieces. Piece of cake! 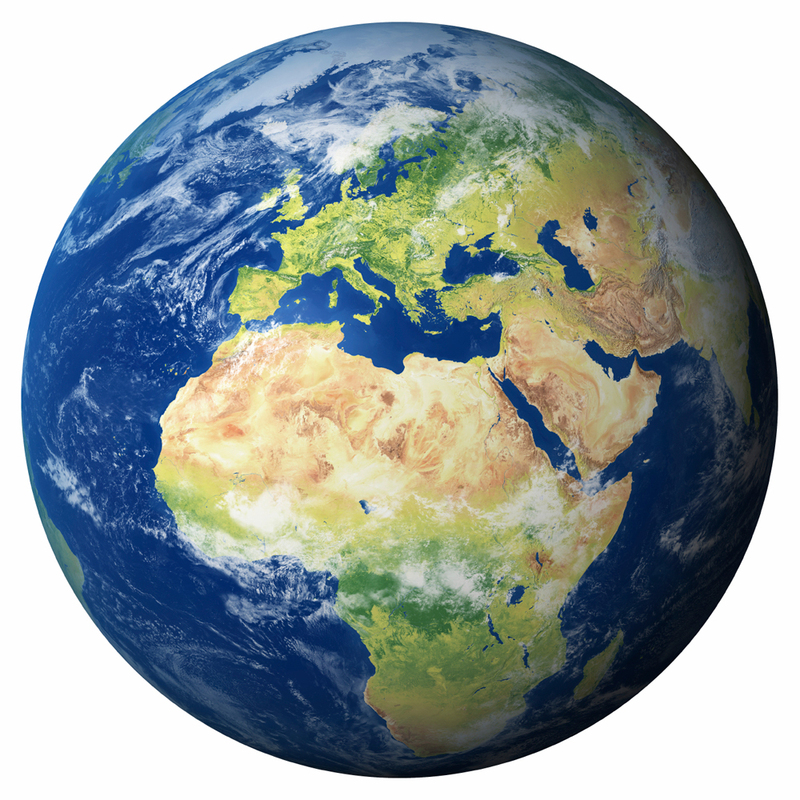 How would you build the Earth? The idea behind “In The Beginning” is that you are playing a role in building the earth. There are mountains, rivers, forests, deserts, and other terrain that need to be placed onto the bare Earth. The winner will be the player who can put out all of their pieces first. The pieces that players must place are sets of different terrain tiles. Each round a set of terrain cards will be available for auctioning. Players will then obtain terrain cards from the auction. These terrain cards can then be played according to a small set of rules, which will then allow that player to place some of the terrain tiles from their supply. Each player begins with the same number and types of terrain tiles. For example, each player might have 2 desert tiles, 3 forest tiles, 4 river tiles, 5 ocean tiles, and 6 mountain tiles and so on. The desert tiles would be the most difficult to place while the mountain tiles would be the easiest to place. In each round there will be a number of piles equal to the number of players plus 2 placed next to the board. The number of cards in the piles will vary as the game goes on. During the first three rounds the piles will each have 2 cards. During rounds 4-6 the piles will have three cards. And during rounds 7-9 the piles will have 4 cards. Players will be bidding on these piles of cards simultaneously by using bidding tokens. Each player has a set of bidding tokens numbered 1 to 27. They may place only one token at each pile face down. Players MUST bid on at least one pile. Players may bid a total of 35 bidding points in any given round. For example, a player may bid on one pile with their “27” token. Then they would only have 8 bidding points left. They could place any combination of bidding tokens totaling 8 points onto remaining bidding piles. All players will place their bids face down. 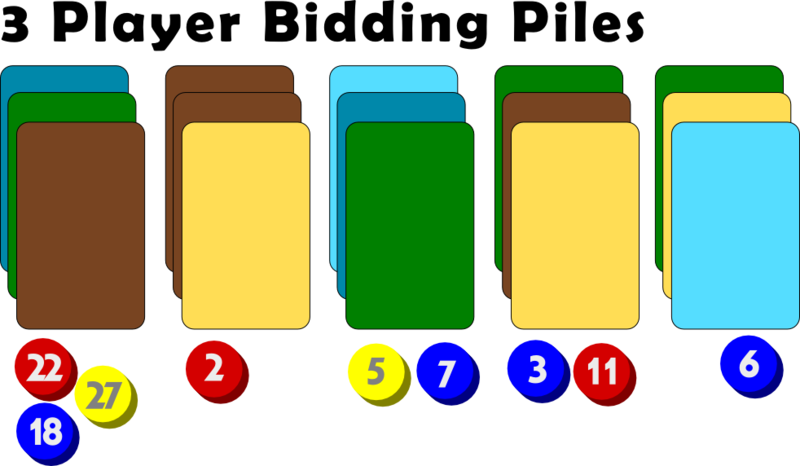 Players may “bluff” by placing their blank token at a bidding pile. After a round of bidding with the bids revealed. Once all bids are placed they are flipped face up. Whichever player has the highest bid at a pile wins those cards. Their bidding token is then discarded for the rest of the game. If a player loses an auction by less than 5 bidding points they can draw a card from the deck. Their bidding tokens are also discarded. If a player loses an auction by more than 5 bidding points they will keep their bidding token but do not get to draw a card. Pile #1: Yellow wins, discards their bidding token and takes the cards. Red loses, but is only 5 away from the winning bid, so Red discards their bidding token and draws a card from the deck. Blue is not within 5 of the winning bid so they keep their bidding token but do not get a card. Pile #2: Red wins, discards their bidding token and takes the cards. Pile #3: Blue wins, discards their bidding token and takes the cards. Yellow loses, but is within 5 away from the winning bid, so Yellow discards their bidding token and draws a card from the deck. Pile #4: Red wins, discards their bidding token and takes the cards. Blue loses, and is not within 5 of the winning bid, so Blue keeps their bidding token but does not draw a card. Pile #5: Blue wins, discards their bidding token and takes the cards. These bidding piles are important because of the cards that they are offering. Because placement of tiles is what wins the game players will be looking to make combinations of cards that allow them to place as many tiles on each turn as possible. So once players obtain cards they can turn them in, in player order, to place their terrain tiles on the board. Placing terrain tiles follows a logical order. For example, you wouldn’t put a desert next to a forest. Well, you could, but it would cost you an extra card. At the start of the game one mountain tile is placed as a starting tile on the board. Any other tile can be placed next to Mountain. But after that there are a series of logical rules for placing the other terrain types. These rules are things like, if you place X terrain by Y terrain then it costs one extra card, or 1 fewer card, or “you must place three”. So there would be a series of these types of rules. So players will want to build the right combinations of sets of cards in their hand so that they can play more terrain tiles than their opponents. This exercise could turn into a full game design if I put in the effort to create the terrain placement ruleset, which I just might do. So what are your thoughts about this game design? Are there any glaring holes in the design? Is anything obviously broken? 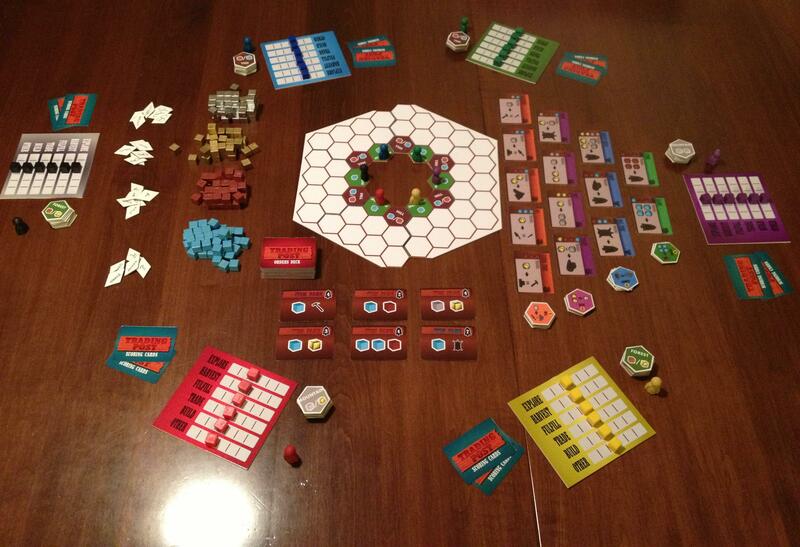 What would you have come up with for the design based on the Boardgamizer criteria? I imagine there are an infinite number of ways to go with those criteria. So make sure you are exercising your game designer mind! And have a great weekend! 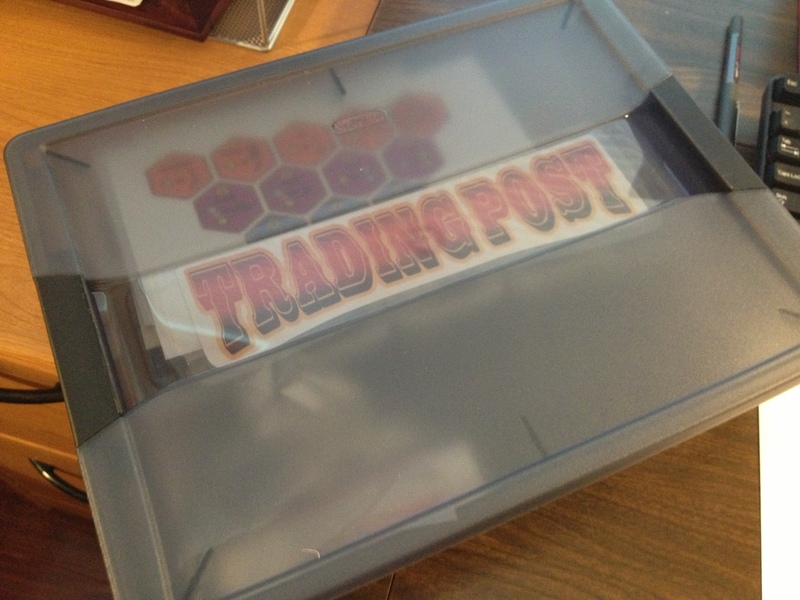 Trading Post Logo… for now. Here you are, explorer extraordinaire! You have been selected from an elite group of explorers to develop a new Trading Post. You role, should you choose to accept it, is to utilize the resources found on your section of their territory, and contribute the most to the Trading Post. Contributions include constructing new buildings for the Trading Post, successfully exploring all of your allotted territory, and completing trades that are beneficial for the Trading Post. Normally when I start a new game design I start with a theme. Trading Post is an unusual case in that it started with both a theme and a map mechanic to be used in that theme. For some reason I thought that a square grid with spots on the corners for putting cubes would be a good idea. And it would seemingly work very well with the Trading Post concept. Octagons represent land/buildings. Diamonds represent resources. The idea of the map is that you can explore the land and add buildings to the octagons. Then each building can produce something that you can place into the diamonds. The resources would be represented by cubes, which would fit very nicely into the diamonds. The really sweet part of this map design is that you have to try and move your goods into the diamonds that adjoin to your territorial neighbors so that you can trade with them without having to use the Trading post as a middle man. With a theme and map mechanic in place it was time to figure out how the game would actually be played. I had found a really nice article online about what makes a game good. It included things like Tension, Replayability/Variability, No Runaway Winner, No Kingmaker, No Player Elimination and more. If anyone know of the article can you share the link? I can’t ever find it. So after working through some of those things in my head I came up with a ladder type design where you would become more capable of doing more things on your turn. The idea of this was that you would start as just a person in the Trading Post. You would thus be able to move one spot per action, and you could only explore up to two rows into your territory. Since exploring all of your land is part of the game it would be important to build up the capability. So the first step would be to purchase a horse via trade with the Trading Post. Once you traded for a horse you would be able to move two spots per action. You would also be able to explore the next row. In the game design the tiles that would be available in this “Horse Region” were better than those available in the “Person Region” (first two rows). This would allow you to do more stuff, make better trades, and work toward the wagon. During the game each action would cost a certain amount of time. The game would be played over 7 years with each action costing a certain number of months. So moving would cost 1 month. That’s why it would be important to upgrade to a horse or wagon as early as possible to be able to move more spots with the same action. Basically with the game being 7 years of 12 months each player would have 84 action points to work with. Because I made “time” part of the game I was able to also have the seasons play a role. Each year had a new “Event” card come up that affected something for the year. This could be seasonally dependent as well. Replayability: Each game would be different since the draw of event cards is random. Variability: Specific scenarios of event cards could be established to promote specific game play. More details: Having event cards made the game deeper, in my opinion. I found early on that having a time mechanic like this made things difficult to design. Since players weren’t always taking the same number of actions on a turn I had to incorporate a “last player gets a turn” mechanic similar to that in Glen More. By doing this I would never have to worry about how player order worked. The other downside of having 84 actions points (84 months) in the game was that every single turn players would have to advance their “months” token and potentially their “years” token if they entered a new year. Fiddly. I thought I really had something with this game design. I was gung ho about putting together a prototype and making this into the most awesomest game ever. With 8 different resources, 84 action points per player, upgrades to a horse and then wagon, land development, trading, exploration, etc. I knew this would be awesome. Perhaps I was being a little too optimistic. In my mind I thought this game had a lot of potential. I put a lot of time into it early on only to realize that it was ridiculously complicated. Next week I’ll cover my initial prototyping efforts and the lessons I learned during that phase. In two weeks I’ll share with you the current re-designed version, which is night-and-day better, potentially even being a playable and fun game. And three weeks from now I’ll discuss my path forward with the game as we approach GenCon. If you have any questions or comments about the game over the next three weeks, just let me know!